Jiří Wiedermann belongs to the first generation of computer scientists graduating in former Czechoslovakia. He works in informatics since the beginning of his scientific carrier in nineteen seventies. His research interests include ad-hoc networks, algorithms (design and analysis), algorithmic systems, applied algorithmics, artificial intelligence, artificial life, cognitive systems, computational complexity theory (incl. non-uniform complexity theory), datastructures, distributed computing, embodied robotics, information technology, intelligent algorithms, languages and automata, machine learning, non-standard computational models (amorphous computing, molecular computing, nano-computing, super-Turing computability, etc. ), networks and network modeling, network algorithms, neurocomputing, parallel computing, philosophy and computing, theoretical computer science, and more. In these fields he published two monographs and more than 150 papers in scientific journals and conference proceedings. Some of his results have entered the monographs and textbooks in computer science. By his invited talks, publications and activities in organization of important European and national computer science conferences he contributed to the development of informatics both at national and international level. In nineteen nineties he acted as the vice-president of the European Association for Theoretical Computer Science (EATCS). Between 2000 and 2012 he served as the director and since 2017 he is the deputy director of the Institute of Computer Science of Academy of Sciences of the Czech Republic. 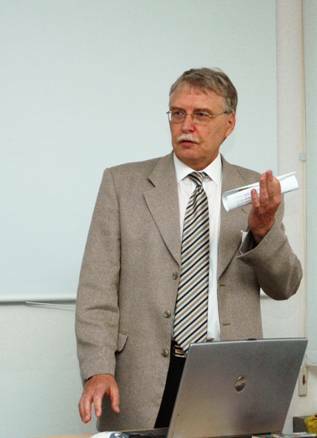 Professor Wiedermann was a member of the board of directors of ERCIM (European Research Consortium in Informatics and Mathematics) (1997-2010) and is a member of Academia Europaea (London) and of the Czech Learned Society (Prague). Theoretical computer science, computational complexity; models of sequential and parallel computational systems; neurocomputing; amorphous computing; non-standard computing; complexity of data structures and algorithms; artificial intelligence, artificial life, embodied cognition, history and prospects of informatics; philosophy of computing. 8. J. van Leeuwen, J. Wiedermann, The computational power of Turing's non-terminating circular a-machines. In: S.B. Cooper & J. van Leeuwen, Alan Turing: His Work and Impact, Elsevier, 2013, pp. 80-84. 19. van Leeuwen, J., Wiedermann, J.: The computational power of Turing’s non-terminating circular a-machines. (Invited) In: S. B. Cooper, J. van Leeuwen (Eds), Alan Turing - His Work and Impact, Elsevier Publ., 2012, to appear. 32. Wiedermann Jiří, Petrů L.: Communicating Mobile Nano-Machines and their Computational Power. In: Nano-Net 2008. Revised Selected Papers.(Ed. : Cheng, M.) - . Berlin : Springer, 2009, pp. 123-130 (ISBN 978-3-642-02426-9) Held: Nano-Net 2008. International Conference on Nano-Networks /3./. Boston (US), 14.09.2008-16.09.2008 (Lecture Notes of the Institute for Computer Sciences, Social Informatics and Telecommunications Engineering. 3). 37. Wiedermann, J., Pardubská, D.: On the Power of Broadcasting in Mobile Computing. Chapter in: B. Cooper, B. Loewe, A. Sorbi (eds. ), New Computational Paradigms: Changing Conceptions of What Is Computable. To appear in LNCS Springer-Verlag, New York Inc., 2007. 44. Verbaan, P.R.A., Leeuwen, J. van, & Wiedermann, J. Complexity of Evolving Interactive Systems. In: Theory Is Forever, Essays Dedicated to Arto Salomaa on the Occasion of His 70th Birthday Springer-Verlag, Berlin, p. 261-281, 2004. 47. Wiedermann, J.: Mirror Neurons, Embodied Cognitive Agents and Imitation Learning. In: Computing and Informatics. Vol. 22, no. 6 (2003), p. 545-559. 51. van Leeuwen, J. - Wiedermann, J.: The Turing machine paradigm in contemporary computing, in: B. Enquist and W. Schmidt (Eds), Mathematics Unlimited - 2001 and Beyond, Springer-Verlag, 2001, pp. 1139-1155. 52. van Leeuwen, J. - Wiedermann, J.: On algorithms and interaction, in: M. Nielsen and B. Rovan (Eds), Mathematical Foundations of Computer Science 2000, 25th Int. Symposium (MFCS'2000), Lecture Notes in Computer Science Vol. 1893, Springer-Verlag, Berlin, 2000, pp. 99-112. 53. Wiedermann, J.: Simulated Cognition: A Gauntlet Thrown to Computer Science. ACM Computing Surveys, Vol. 31, Issue 3es, paper No. 16, 1999. 54. Wiedermann, J.: Towards Algorithmic Explanation of Mind Evolution and Functioning (Invited Talk). In: L. Brim, J. Gruska and J. Zlatuška (Eds. ), Mathematical Foundations of Computer Science, Proc. of the 23-rd International Symposium (MFCS'98), Lecture Notes in Computer Science Vol. 1450, Springer Verlag, Berlin, 1998, pp. 152--166. 55. Šíma, J. - Wiedermann, J.: Theory of Neuromata. Journal of the ACM, Vol. 45, No. 1, 1998, pp. 155--178.